This week Latin Pulse focuses on the debate over the controversial gang truce in Honduras and what can be learned from the politics and conditions of a similar truce in El Salvador. The truce is between the Honduran factions of the street gangs MS-13 and Barrio 18: these gangs include tens of thousands of members in the United States and Central America. Experts in Mexico and the United States weigh in on the truce and give important context. This week, the news segment of the program looks at the diplomatic breakthrough between the United States and Venezuela. The program includes in-depth interviews with: Sonja Wolf of INSYDE; and Jon Wolseth, author of “Jesus and the Gang.” Executive Producer: Rick Rockwell Associate Producer: Curt Devine Writer: Zach Cohen. 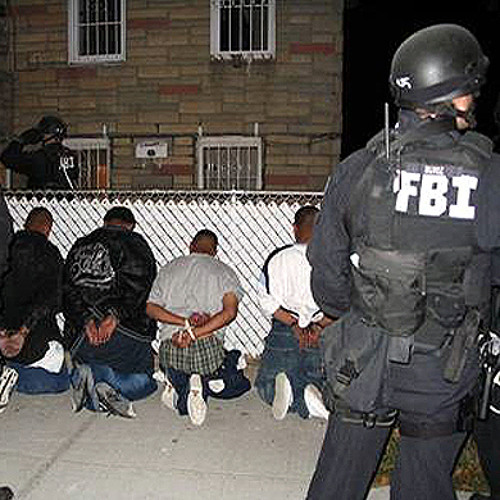 This program is a direct sequel to this recent program: https://soundcloud.com/latinpulse/honduras-gangs-drugs-diplomacy-lp5312013 The photo of the FBI rounding up suspected members of the MS-13 street gang is from the FBI and as it is from the U.S. government, it is in the public domain.